Early mornings are usually uninterrupted time. The house is quiet. Birds quietly waking up and singing outside. Chocolate is calling. 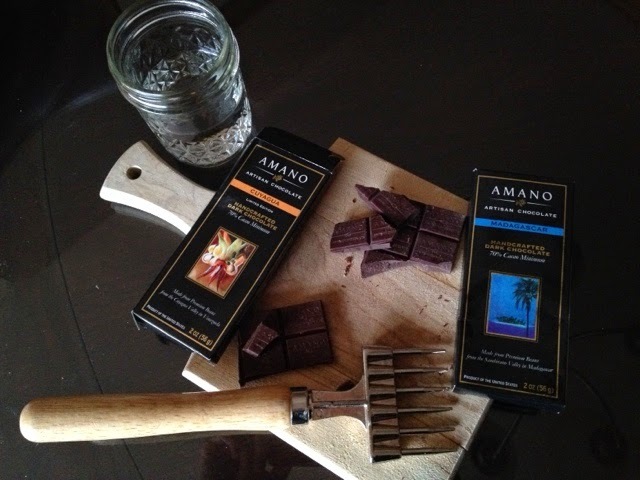 Chocolate fork and cutting board in hand, a small mason jar of room temperature water for palette cleansing close by, I start my day. This morning was a comparison of two bars from the award winning bean to bar maker from Orem Utah, Amano Artisan Chocolate. Cuyagua: Cacao beans from the secluded Cuyagua valley at the base of the coastal mountains in Venezuela. Deep dark chocolate with reddish hints. Very dense and hard with a crisp snap. A slow melt that reveals notes of espresso, tobacco, and burnt sugar. The roasty and earthy flavors linger. The dark earthy flavors make this bar seem very manly. I bet it would pair well with bourbon. Perhaps 5 am is too early for that pairing. Madagascar: Beans from the Sambirano Valley of Madagascar. 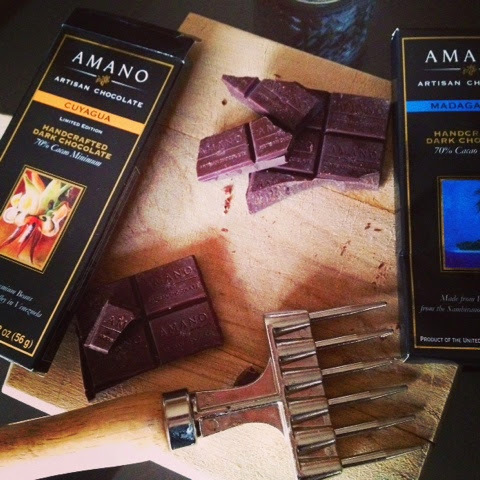 The original cacao beans in this area are said to be Criollo brought from Venezuela at the turn of the century. Chocolate brown but on the lighter side with a deep sounding snap. Hardly any scent, perhaps it is still a bit too cold and I am too impatient to wait for the scent. At first taste bitter and tangy citrus notes blend together on my tongue changing rapidly into something that reminds me of grape juice and then black currant floats by. The smooth melt has a clean finish with berry and citrus notes.